If your pet is a Dermatology patient it’s important to remember that the skin may not be the only organ affected by the disease. That’s why other disciplines, such as internal medicine, oncology, ophthalmology, soft tissue or neurology, may be consulted. This mutual investigatory and management plan achieves the best outcome for the patient. 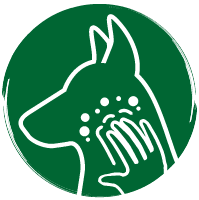 As primary skin and ear diseases are easily accessible, our team are able to fully examine the skin and take surface samples on the day of your pet’s appointment. In many cases a probable diagnosis can be formulated within the consultation which means you and your pet may be able to leave the hospital on the same day, too. We are available to your referring vet to discuss cases via phone or email but are unfortunately unable to provide advice direct to owners prior to a first appointment.